All irrigating solutions are reasonably effective in washing, reducing friction (i.e., lubricating instruments) and balancing against a rise in temperature. The important differences between products are related to their ability to dissolve tissue and kill microbes, 2 key areas.2 Traditionally, sodium hypochlorite (NaOCl) and ethylene diamine tetraacetic acid (EDTA) have been the most commonly used root canal irrigants. NaOCl dissolves organic tissue effectively (less so vital pulp tissue) and kills bacteria and yeasts. 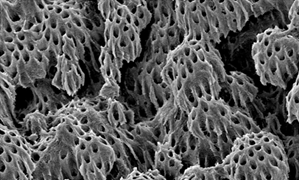 EDTA dissolves inorganic tissue by chelation, but it has no antibacterial activity in the root canal. Because of the differences between these irrigants, the classical recommendation of using NaOCl (2%–6%) during instrumentation and EDTA (17%) after treatment is still valid and highly recommended (Figs. 1–4). These 2 solutions cannot be used simultaneously as NaOCl loses its antimicrobial efficacy in the presence of EDTA. Figure 1: Smear layer after instrumentation. Chlorhexidine (CHX) has no effect on the smear layer and sodium hypochlorite (NaOCl) affects only the organic part of the smear layer, which is not sufficient to remove it. Figure 2: Smear layer removed by NaOCl followed by ethylene diamine tetraacetic acid (EDTA). Figure 3: Irrigation by EDTA alone results in incomplete removal of the smear layer, because the organic matter of the layer has not been dissolved. Figure 4: Uninstrumented area of a root canal wall after irrigation with NaOCl and EDTA. The special structure, “calcospherites,” are clearly seen, indicating complete removal of any organic debris covering them. A new and noteworthy twist in this area has come from recent studies that indicate that long-term exposure (1 hour) to NaOCl can weaken the structural integrity of dentin. It has also been shown that, after the final EDTA (or citric acid) rinse, even a short NaOCl rinse (1 minute) causes quite prominent erosion of root canal surface dentin.4,5 Therefore, until further information is available, final rinse with NaOCl after EDTA should be limited to a few seconds. Another option, with several benefits, would be to use chlorhexidine (CHX) as the final rinse. CHX does not dissolve tissue (no erosion) but it kills microbes (Fig. 5). It also improves the quality (i.e., strength) of long-term resin bonding to dentin by inhibiting dentin enzymes (e.g., matrix metalloproteinases), which otherwise degrade the bond over time.6 Recent studies have shown that CHX mixed with a surface active agent (CHX-Plus, Vista Dental Products, Racine, WI) has superior antibacterial effects compared with CHX alone.7 However, as CHX has no tissue-dissolving effect, its use as the main or only root canal irrigant cannot be recommended. Even if (in theory) all bacteria were killed by CHX, the canal walls would be covered by a smear layer and organic debris including biofilms, which would not allow an adequate seal between the sealer–root filling and the canal wall dentin. Figure 5: Uninstrumented part of a root canal wall after irrigation with CHX alone or EDTA alone. These solutions do not dissolve organic tissue, which, therefore, remains if NaOCl is not used during instrumentation. The irrigant of choice is NaOCl used continuously during instrumentation followed by a 2-minute rinse with EDTA to remove the smear layer. When maximal antimicrobial effect is desirable, CHX is a good choice (rather than NaOCl) as a final rinse after EDTA to further facilitate disinfection and to improve dentin bonding (where relevant). Dr. Haapasalo is head of the department of oral biological and medical sciences and chair of the division of endodontics at the University of British Columbia faculty of dentistry, Vancouver, British Columbia. Acknowledgements: Special thanks to Dr. Ya Shen and Wei Qian for their help with scanning electron micrograph images. The author has no declared financial interests in any company manufacturing the types of products mentioned in this article. Haapasalo M, Endal U, Zandi H, Coil JM. Eradication of endodontic infection by instrumentation and irrigation solutions. Endod Topics. 2005;10(1):77-102. Haapasalo M, Shen Y, Qian W, Gao Y. Irrigation in endodontics. Dent Clin North Am. 2010;54(2):291-312. Review. Zehnder M. Root canal irrigants. J Endod. 2006;32(5):389-98. Review. Tatsuta CT, Morgan LA, Baumgartner JC, Adey JD. Effect of calcium hydroxide and four irrigation regimens on instrumented and uninstrumented canal wall topography. J Endod. 1999;25(2):93-8. Marending M, Paqué F, Fischer J, Zehnder M. Impact of irrigant sequence on mechanical properties of human root dentin. J Endod. 2007;33(11):1325-8. Carrilho MR, Geraldeli S, Tay F, de Goes MF, Carvalho RM, Tjäderhane L, et al. In vivo preservation of the hybrid layer by chlorhexidine. J Dent Res. 2007;86(6):529-33. Shen Y, Stojicic S, Qian W, Olsen I, Haapasalo M. The synergistic antimicrobial effect by mechanical agitation and two chlorhexidine preparations on biofilm bacteria. J Endod. 2010;36(1):100-4.